This is a quick and healthy one-dish meal with plenty of protein, healthy monosaturated fat, fiber, and good clean carbs. The Rosemary in the beef adds a nice dimension, but has the added benefit of neutralizing HCAs (cancer-causing substances) that form when meat is cooked at high temperatures. Combine Garlic and Olive Oil in a small cup and allow the garlic to infuse into the oil for at least 30 minutes. This can be done a day ahead, and left on the kitchen counter at room temperature overnight. Brush both sides of each filet with the garlic infused oil and some of the garlic bits. Sprinkle both sides of each filet with the rosemary, and fresh ground pepper and salt to taste. Grill to desired temperature, allow steaks to rest for 20 minutes after grilling, and slice each steak into thin strips. Combine romaine, croutons, onion, 3/4 of the Parmesan cheese, and 3/4 of the dressing into a medium salad bowl and toss to thoroughly to coat all leaves. Divide salad mixture among two large plates and top with steak strips. Sprinkle with remaining Parmesan Cheese and drizzle with remaining dressing. Garnish with anchovy fillets. Combine all ingredients except ice cubes into blender and blend until smooth. Add 8-10 ice cubes and blend until thick. Pour into two glasses and serve garnished with pineapple. Creme Brulee -- Half the Calories, Half the Fat, 100% of the Taste! As posted, this recipe is almost sugar free and uses Erythritol and Liquid Stevia Extract for Sweeteners. If you don't care about making it sugar free, you can substitute 4 Tbsp. granulated Sugar in place of the Erythritol and stevia. If you're not familiar with erythritol, it has almost no calories, and does not promote tooth decay. Moreover, erythritol has not been found to affect blood sugar or insulin levels and has a zero glycemic index. It is about 70% as sweet as table sugar, and behaves like sugar in that it adds about the same bulk to baking recipes as sugar does. Preheat oven to 325 degrees and bring a kettle of water to a boil. Whisk egg yolks, Erythritol, 20 drops of liquid stevia extract, and vanilla in a medium bowl until thick and creamy. Pour cream and half and half into a medium sauce pan and scald to almost boiling. Gradually whisk half the scalded cream into the egg mixture to lighten (this helps to prevent curdling). Gently stir the egg mixture back into the remaining cream in the saucepan and stir constantly over medium heat just until the mixture returns to almost boiling again and very slightly thickens--about 6 minutes. Place 6 creme brulee dishes or 1/2 cup ramekins in a baking dish, and divide the custard mixture evenly among them. Place the baking dish with the creme brulees on the middle oven rack and fill the baking dish with boiling water to a depth of halfway up the sides of the creme brulee dishes. Bake for 35-40 minutes or until the custard is just set, but giggles a bit when shaken. Remove from baking dish, cool to room temperature, cover with plastic wrap, and refrigerate until ready to serve. Prior to serving sprinkle each brulee with 1 tsp. granulated sugar; and using a blowtorch, burn the sugar until it is bubbly and carmelized. Garnish with fresh berries. Total fat: 9 g; Carbohydrates: 35 g; Protein: 36 g.
High protein, low fat, and huge in flavor, this one dish meal will have you asking for more. . .Go ahead, it's GOOD for you TOO! Take two (of the 6) cloves of garlic and smash them with the broad side of a chef's knife. Rub the smashed garlic cloves on both sides of chicken breasts. Season breasts on both sides with salt and fresh ground pepper. Grill or Broil Chicken Breasts until cooked through. While chicken breasts are cooking, drop the pasta into boiling salted water and cook according to package directions, just until al dente. Press or mince remaining 4 cloves of garlic and saute the garlic and the mushrooms in the 3 Tbsp. of EVOO. Season with salt and fresh ground pepper, and saute until the mushrooms give up most of their liquid. Combine Vermouth, Chicken Broth, and Cornstarch in a small bowl or pitcher. Stir, and add the cornstarch/broth/wine mixture to the mushrooms and bring to a gentle simmer, whisking constantly. Simmer until sauce is slightly thickened and satiny. Taste and adjust salt and pepper. Drain pasta and place onto serving platter. Top pasta with the chicken breasts, and pour all of the garlic mushroom wine sauce over the breasts and pasta. Sprinkle with shredded Parmesan cheese. Serve immediately. Rosemary minimizes or eliminates carcinogens formed when meat is cooked. Scientists at Kansas State University found that seasoning beef with rosemary before grilling or roasting can reduce cancer-causing substances called heterocyclicamines by 30 to 100%. Danish scientists got similar results when adding rosemary to dough. Acrylamide, a potentially carcinogenic compound, forms in carb-rich foods when heated above 250 degrees F. By incorporating 1 tablespoon of dried rosemary for each pound of flour, we reduced acrylamide by more than 50%, says Leif Skibsted, PhD, a professor of food chemistry at the University of Copenhagen. He believes that the antioxidants in rosemary scavenge the harmful compounds. The White Button Mushrooms in the Rosemary Mushroom Bordelaise are a natural aromatase inhibitor. Research as shown that White button mushrooms (Agaricus bisporous) are a potential breast cancer chemopreventive agent, as they suppress aromatase activity and estrogen biosynthesis. For men, this also means that Button Mushrooms help to keep testosterone from converting to estrogen. One day ahead, combine 4 cloves of minced garlic and the 1/2 Cup of olive oil into a small cup or bowl. Allow the garlic to infuse the olive oil at room temperature overnight. Into a small saucepan combine the beef stock and 2 smashed garlic cloves and gently reduce over medium heat until liquid is reduced to 1-1/2 cups. This step can be prepared a day or more in advance, and the reduced beef stock refrigerated in a covered container until ready to use. Brush the beef tenderloin with HALF the garlic infused oil including half the minced garlic bits. Sprinkle all sides of roast with the 1 Tbsp. minced rosemary leaves, salt and plenty of fresh ground black pepper to taste. Place roast diagonally in a shallow roasting pan. Tuck the thin end under for even cooking. Cover tightly with plastic wrap and refrigerate. Remove the roast from the refrigerator and let stand at room temperature for 45 minutes prior to roasting. Preheat oven to 500 degrees F. Roast for 20 minutes without disturbing. Lower oven temperature to 375 degrees and continue roasting for another 12-15 minutes until a meat thermometer inserted into thickest part registers 135 degrees for rare. Note that the thickest part of the roast will be rare, while the remainder of the roast will be more medium rare, and the thinner ends will be medium. Remove roast from oven and tent with foil. Allow the roast to rest 20 minutes before slicing. If you don’t rest the tenderloin, when sliced, all the meat juices will end up on your cutting board and kitchen floor, rather than infused within the meat. Your finished roast will be dry and ugly. Always rest all cooked meats and poultry prior to slicing or plating. Make the sauce: In a large skillet or sauté pan, sauté the mushrooms in remaining olive oil/garlic mixture from step 1, until the mushrooms begin to give up their liquid. Add the wines and the reduced beef stock, rosemary, salt, and pepper. Bring to a gentle boil, and then whisk in the cornstarch mixture. Gently simmer about 5 minutes longer or until the sauce is slightly thickened and satiny. 5 lbs. Redskin Potatoes, lightly scrubbed, rinsed, and quartered. Boil potatoes in salted water with three cloves of garlic that have been smashed with the side of a chef’s knife. Melt butter with remaining two cloves of garlic (minced or pressed) and the minced rosemary leaves. Drain potatoes thoroughly and return to pan and coarsely mash. Stir in the melted garlic-rosemary butter, and nutmeg. Add enough hot milk to yield the desired consistency. Season with salt and pepper to taste. Definitely another crowd-pleaser! This recipe has some fat (7g. saturated) because of the cheese, but with 33 grams of protein, 30 grams of carbs, and 8 whopping grams of fiber, it's plenty healthy. 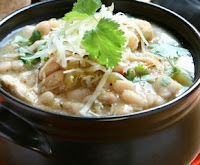 Always rinse the beans to remove excess sodium--control the salt yourself by adding as much or as little as you desire. 3 tsp. Cumin (a little more to taste)--Watch Freshness (cumin gets stale very fast)! Additional Cumin for seasoning chicken breasts—about 1-1/2 tsp. Lightly season chicken breasts with garlic salt, fresh ground pepper, and some additional cumin. Grill or broil until cooked through. Cool slightly and dice or shred as desired. In a stock pot or Dutch oven, sauté onions and garlic in olive oil until translucent. Add spices and green chilies. Vigorously stir in flour to make a roux. Add 1/2 carton Chicken Stock and whisk till smooth. Add remaining chicken stock and bring to a boil. Add Beans and chicken, salt and black pepper. Simmer about 20 minutes. Reduce heat to low, and add the wine or vermouth, and gradually add 2/3 of each cheese, stirring thoroughly until cheese is melted and smooth. Do not boil once the cheese is added. Serve garnished with chips, a dallop of low fat sour cream and remaining cheese. Cook's Note: The wine or vermouth helps to keep the cheese from clumping. Omit it if you wish, but realize that the cheese may become gloppy. If you could take every macro-nutrient for good health and longevity and put it into one bowl, this would be it. This recipe is a powerhouse of flavorful, colorful, raw vegetables,herbs, fiber, and good monosaturated fat. The 5 types of beans provide a good amount of protein. This is always a crowd-pleaser at parties. The marinated base keeps in a covered container in the fridge for a good week. Be sure to rinse the beans thoroughly to eliminate 45% of the sodium. Make the dressing (recipe follows). Make the base and marinate overnight (recipe follows). Just before serving, cut or tear any hearty lettuce (romaine works well) into bite size pieces. Into your salad bowl, mix equal parts of the marinated bean mixture and lettuce. Toss with serveral big handfuls of shredded Parmesano Reggiano cheese and additional dressing to taste. Croutons at the last minute optional. Mix first 5 ingredients in a shaker or bowl till combined. Slowly add olive oil while shaking or whisking to form an emulsion. Set aside. Combine in a large covered bowl with 2/3 of dressing and marinate at least 4 hours or overnight in the refrigerator. Optional -- Top with 6 ounces of grilled salmon, chicken or steak; or a can of albacore tuna for a nice one-dish meal! This recipe calls for canned black beans. If you read the label, you'll notice that, save for reduced-sodium versions, all canned beans are high in sodium. Thoroughly rinsing canned beans reduces the sodium content by 45%! Always thoroughly rinse canned beans, especially if you have issues with hypertension. You can reduce the sodium further, by starting with reduced sodium black beans, but you'll pay about 50% more per can. I say just by the cheap ones and rinse the hell out of them. This recipe is high in fiber, contains good fats, and weighs in at a whopping 4 grams of protein per serving. What's more, it tastes great! Enjoy it with some homemade garlic pita chips. In a medium-sized wide saucepan or saute pan, heat olive oil over medium heat and add garlic, onion, cumin, and oregano. Saute until onions and garlic are slightly softened (about 5 minutes). Stir in the green chilis. Remove from heat and cool to room temperature. In the bowl of food processor fitted with the metal knife blade, process the cream cheese and cottage cheese until smooth. Add remaining ingredients except for the cilantro to the food processor and process until smooth. Pulse in the 1/2 cup of packed cilantro just until incorporated. Chill overnight to blend flavors. Garnish with additional chopped cilantro. This recipe comes from a good friend Rosemary Andreozzi Schwenk, who's ancestors hail from Lucca. This sauce, with a hint of cinnamon, nutmeg, and allspice is typical of the region. Rosemary's original recipe used garlic salt (which some say is necessary for good sauce). In this version, I use fresh garlic instead and add mushrooms which are a natural aromatase inhibitor. Cooked tomato products (spaghetti sauce, pizza sauce, tomato paste, tomato sauce, ketchup, etc.) contain high-concentrations of the antioxidant Lycopene. Lycopene, perhaps best known for it's cancer preventative properties in prostate cancer, also helps neutralize free radicals in heart disease, helps break down LDL cholesterol, improves the health of the skin, helps reduce cancer, and even helps reduce the symptoms of age-related macular degeneration. For more information on the benefits of Lycopene, click here. Working in a large non-reactive roasting pan (with cover), brown the ground beef with the garlic and parsley on stove top in 1/4 C. olive oil. Working in 2 or 3 batches, puree the onions, carrots, and celery in a food processor with 1/2 of one carton of chicken stock. Add the pureed vegetable mixture to the browned meat and stir to thoroughly combine. Cover the roaster and bake in a 425 degree oven for 15 minutes. Remove the roaster from the oven and add the salt, pepper, nutmeg, allspice, cinnamon, and the remaining half of the first carton of chicken stock. Stir until thoroughly incorporated and return the covered roaster to the oven for another 15 minutes. Remove the roaster from the oven and add the tomato sauce, tomato paste, and remaining carton of chicken stock. Thoroughly stir to combine. Add the mushrooms (juice and all) and stir again. Lower oven temperature to 350 degrees and roast again in the covered roaster for 1-1/2 to 2 hours WITHOUT STIRRING. Use care to NOT scrape any burned sauce that has splashed on the sides of the roaster, as it will make the sauce bitter. Taste and adjust seasonings as desired. This recipe contains Rosemary. Rosemary (either fresh, dried, or in extract form) when added to meats prior to cooking, significantly reduces the amount of heterocyclic amines (HCAs)--the cancer-causing chemicals that form when meats are heated to high temperatures. Rosemary is a source of two powerful antioxidants called rosmarinic acid and carnosic acid which are the components responsible for reducing HCAs from forming when meat is heated. In a small bowl, mince or press 4 garlic cloves, add dill, 2 T. of the rosemary, Dijon mustard, vermouth, and olive oil. Mix until thoroughly combined, forming a paste. Set aside. Slice remaining two garlic cloves into several small slices or slivers. Place roast fat side up in a roasting pan. Using a small paring knife, make 1 inch deep slits over the entire roast and insert garlic slices, evenly distributing garlic slices all over the roast. Generously season roast on all sides with salt and pepper. Evenly coat the roast on all sides with the seasoning paste from step 1. Place into a roasting pan, cover tightly with plastic wrap, and refrigerate roast until 30 minutes before roasting time—Preparation to this point can be done 24-48 hours in advance, the longer the better. Remove roast from refrigerator and allow to come to room temperature. Combine vegetables, 3-4 T. oilive oil, and remaining 2 T. fresh rosemary. Season with salt and pepper; stir until vegetables are evenly coated with olive oil and seasoning. Roast at 500 degrees for 20 minutes. Lower oven temperature to 350 and continue roasting 60-70 minutes longer, until meat thermometer inserted into center of roast registers 160 degrees. Remove from oven, tent with foil and allow roast to rest for 15 minutes before carving. Nutrition information: Calories 266, Saturated fat: 3.6 g, Polyunsaturated fat: 6.1 g, Monosaturated fat: 18.4 g, Carbohydrates: 1.3 g, Protein 2.5 g.
1. Combine All Ingredients EXCEPT OILS into Food Processor and process until smooth.